It is still February. I am still irritable. I already watched my February palliative [Enchanted April (1991), in which four lonely women leave cold, drippy, 1920’s London for a holiday in Italy, where they thaw out and rediscover love], and it’s too soon to re-watch it. Thank goodness March starts Sunday, with a predicted high of 35°F. Heat wave! Speaking of clothes, I watch award shows for the gowns. Recently, I tend to skip the show and look at the gowns afterwards online. I am also a fan of Downton Abbey, saw the costume exhibit at Winterthur, and appreciate the costumers’ attention to detail; hemlines were shorter in 1926 than in 1924, for example. Several different outfits might be required in a single day upstairs. Clothes were not only for specific activities but were (are) used to reflect roles, station, and boundaries of time. I think it is not surprising that a blurring of the clothing requirements of work (or school) versus home have been followed by a blurring of boundaries between work and home. Electronic connections have accelerated this, but I think that followed the change in mindset. The maftir reading for Shabbat Zachor (“remember”) is Deuteronomy 25:17-19, in which we are commanded to not forget Amalek’s cowardly attack on the Israelites yet simultaneously blot out his memory from under the heavens. In the special Haftarah (1 Samuel 1-34, 2-34 for Ashkenazim. No, I don’t know why. ), Saul’s kingship is doomed in part because he lets Agag, the Amalekite king, live; Samuel kills Agag instead. Shabbat Zachor is the Sabbath right before Purim, which starts Wednesday night. In the Book of Esther, villain Hamen is supposedly a descendant of Amalek and hero Mordecai, of Saul. See, it all ties together. A1: None. Atheists don’t believe in light bulbs. Or, you can get a smaller, necklace version for only $16.15 (4.5×3 cm, 1.8” x 1.2”, WCG-1215-44). FAIR LAWN, March 7 – The Orthodox Jewish world was shaken today by the announcement that a Talmud volume discovered last month in the City of David archaeological dig in Jerusalem seems to provide justification for the use of cell phones to send text messages on Shabbat. The practice, used by Orthodox teens and popularly known as “keeping half-Shabbos” was widely reported in Jewish newspapers last summer. The Talmud scrolls, titled Tractate Textin, describe in intricate detail the way that God communicated with the Kohen Gadol (High Priest) in the Temple. 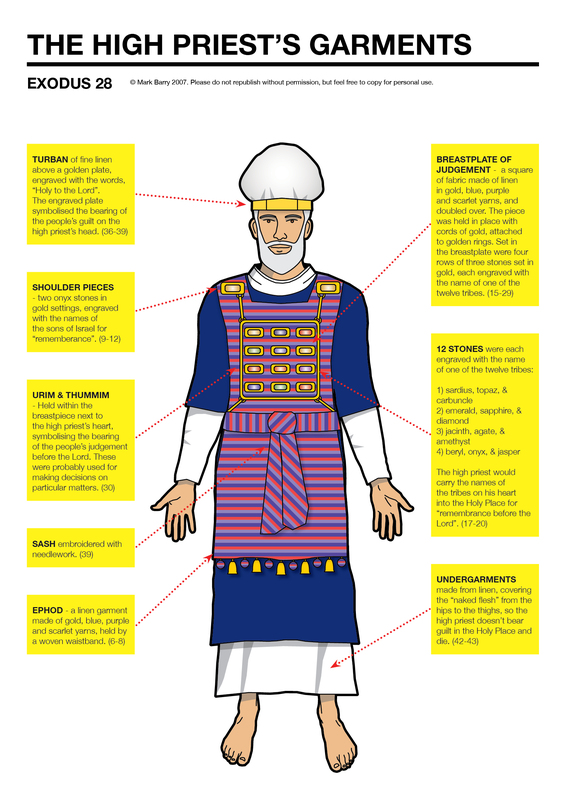 The high priest wore a breastplate on a special garment called an ephod. 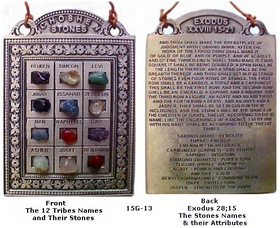 The breastplate contained twelve colored stones. Linguists now are suggesting that ephod, iPod, and iPad are essentially the same word, allowing for the evolution of language over the millennia. The twelve stones, called Urim v’Tumim, may be the first iPad and iPhone apps on a device about the same size as the iPad. Week 1 – Memo No. 1 Effective this week, the company is adopting Fridays as Casual Day. Employees are free to dress in the casual attire of their choice. Week 3 – Memo No. 2 Spandex and leather micro-miniskirts are not appropriate attire for Casual Day. Neither are string ties, rodeo belt buckles or moccasins. Week 6 – Memo No. 3 Casual Day refers to dress only, not attitude. When planning Friday’s wardrobe, remember image is a key to our success. Week 8 – Memo No. 4 A seminar on how to dress for Casual Day will be held at 4 p.m. Friday in the cafeteria. A fashion show will follow. Attendance is mandatory. Week 9 – Memo No. 5 As an outgrowth of Friday’s seminar, a 14-member Casual Day Task Force has been appointed to prepare guidelines for proper casual-day dress. Week 14 – Memo No. 6 The Casual Day Task Force has now completed a 30-page manual entitled “Relaxing Dress Without Relaxing Company Standards.” A copy has been distributed to every employee. Please review the chapter “You Are What You Wear” and consult the “home casual” versus “business casual” checklist before leaving for work each Friday. If you have doubts about the appropriateness of an item of clothing, contact your CDTF representative before 7 a.m. on Friday. Week 18 – Memo No. 7 Our Employee Assistant Plan (EAP) has now been expanded to provide support for psychological counseling for employees who may be having difficulty adjusting to Casual Day. Week 20 – Memo No. 8 Due to budget cuts in the HR Department we are no longer able to effectively support or manage Casual Day. Casual Day will be discontinued, effective immediately. This entry was posted in Uncategorized and tagged altar, Amalek, clothing, Deuteronomy, ephod, Exodus, menorah, olive oil, priests, Purim, Samuel, Saul, Shabbat Zachor, vestments. Bookmark the permalink.